1. "For example, "pad" drilling techniques allow rig operators to drill groups of wells more efficiently, because improved rig mobility reduces the time it takes to move from one well location to the next, while reducing the overall surface footprint. A drilling pad is a location which houses the wellheads for a number of horizontally drilled wells. The benefit of a drilling pad is that operators can drill multiple wells in a shorter time than they might with just one well per site." 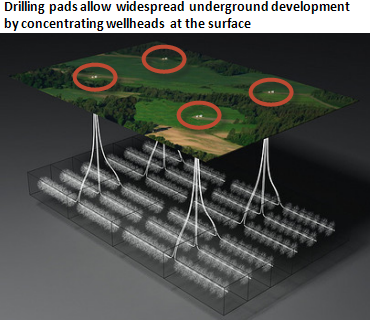 "In the top picture above, each of the four drilling pads hosts six horizontal wells. Pad drilling allows producers to target a significant area of underground resources while minimizing impact on the surface. Concentrating the wellheads also helps the producer reduce costs associated with managing the resources above-ground and moving the production to market." 2. "Moving a drilling rig between two well sites previously involved disassembling the rig and reassembling it at the new location ("rigging down" and "rigging up") even if the new location was only a few yards away. Today, a drilling pad may have five to ten wells, which are horizontally drilled in different directions, spaced fairly close together at the surface. Once one well is drilled, the fully constructed rig can be lifted and moved a few yards over to the next well location using hydraulic walking or skidding systems, as demonstrated in this video by Range Resources." "One of the industry's more recent innovations, pad-to-pad moves, underscores the efficiency gains from rig mobility and pad drilling. During the drilling operation in the bottom picture above, rig operator Nabors Industries transported a fully-assembled drilling rig about one mile between drill sites. 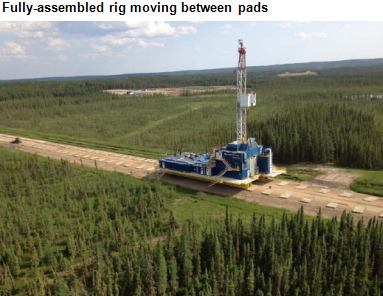 The cost of rigging down and rigging back up can be high enough that producers may find it more efficient to build a road between two pads, transport the rig intact, and have it arrive ready to drill the next well." One little problem: Bakken wells drilled in the Summer of 2011 produced about 30% Less oil over the following 12 months as wells drilled in the Summer of 2010. The Eagle Ford is trending pretty much the same. This happens in all oilfields, but, not usually this fast. The report, from information and analytics firm IHS Inc., looked at well performance for oil and oil-rich liquids in the Eagle Ford as well as in the Bakken Shale of North Dakota and Montana, currently the nation's top play. The Bakken has more wells than the Eagle Ford, but so far, on a per-well basis, the Eagle Ford seems to be producing more than the Bakken. This is a bit off topic, but I'd like to thank Mark Perry for not posting one damn thing to remind us of 9/11. Instead, he posts a story about how technology is reducing drilling costs (as it always has), lowering the pickable fruit. Hooray. Something much more worthy of commemoration. Since the companies go after the easy oil and tend to concentrate on the core areas early in the game this is to be expected. But there is another problem with Mark's posting; the method described is not new. It has been going on for some time and has been in use by a number of companies without much success in achieving self financing. Until we start to see positive cash flows I will remain a skeptic. The thing is, the newer, more technologically advanced (and, of course, more expensive) wells aren't producing as much oil as did the older wells. As I have been pointing out, shale formations are very different from each other and non-core areas are not very promising. The problem is that the companies need to drill those areas or write down a big chunk of their balance sheet. It seems to me that the likely approach will be to use asset sales and new debt/equity to keep getting paid for as long as possible. Oh, you mean technology does not stand still? You mean the profit motive still works? You mean the private sector gets better and better and does more for less, while the public sector, including the military, does less for more every year? With oil still near $100 a barrel, look for gluts in a few years. That is what was said when oil hit $50 and hundreds of billions were invested in new projects. But production of light sweet is still below the 2005 peak and the only thing that is keeping a lid on oil prices is a collapse in demand.